After a short two year hiatus, we once again have One Party Rule in Washington D.C. Based on historical precedent, we can expect an increasing growth rate for government spending, increasing growth rate in the size and scope of government, constitutional checks & balance undermined, inadequate oversight and a consequent increase in abuse of power and corruption. Arguably, we can also expect to get embroiled in another war. This last seems unlikely with Obama, but... There does seem to be a real appetite from the left for some kind of U.S. intervention in Darfur. And if there is another Rawanda-like genocide somewhere in Africa or Eastern Europe, what will we do? What will Obama do? Tough call. But on the other hand, we have "Hope" along with our One Party Rule. So, I guess everything will be ok. It is my sincere hope that the Obama administration will be able to avoid these historical pitfalls and prove to be an exception to the One Party Rule. Why not? His campaign and election has shattered historical precedent every step of the way. Reason enough to hope. But just in case, lets take a realistic look at the prospects for restoring divided government in the next two cycles. "We will need a Republican President in 2008 to maintain a divided government state. Fortunately we have some great Republican candidates. Hagel, Giuliani, and McCain would all make great presidents, and all are a significant improvement from what we have today." I did not predict a Republican would win, but that electing a Republican President was the only path to continuing divided government.While I got the partisan political environment correct, the voters disagreed with me about McCain as a candidate for president. So it goes. The predictions were based on nothing more than structural factors in the congressional elections and historical precedent. We'll take the same approach looking forward to the next two elections, and assess the likelihood of reestablishing divided government in pursuit of the expected benefits that go with it. As we did in '06, we'll first explicitly spell out the premises/assumptions, and on that foundation we will build the DWSUWF positions and recommendations for the 2010 and 2012 elections. NOTE: - You may want to skip this post. It is what I call a "reference post" (more reference posts in the left sidebar). I don't want to have to repeat this analysis over and over in future posts, so I'll keep it here, update it, and link to it as needed over the next two years. Assumption 1) The Divided Government hypothesis holds true to form. We had divided government for two years. As outlined in this recent post, we can can document that divided government did indeed begin to incrementally undo some of the damage of One Party Rule along with accruing benefits consistent with historical divided government precedent. One possible fly in the ointment - while 2007 spending growth was indeed restrained, it is yet To Be Determined what the final spending tally will be after we include 2008 spending with bailouts and stimulus packages included. I expect the final conclusion may depend on whether the bailouts are characterized as spending or "investments" as some have suggested. I'll update the blog with a final assessment of our painfully short exercise in divided government in a future post. Assumption 2) The "100 year precedent" holds for the House of Representatives. I first learned of the "100 year precedent" from a Ken Fisher analysis predicting election results in 2006. "A basic rule of politics and a little-known fact: The Senate changes hands so much more easily than the House that in 100 years the House has never changed hands unless the Senate has, too. Since the Seventeenth Amendment allowed for direct election of Senators in 1913, the House majority has never changed hands without the Senate also doing so... For the Democrats to win the House they must win the Senate..."
Fisher used this precedent to predict that Republicans would continue to hold majorities in both house of Congress in 2006, since they had a structural advantage in the Senate races. Here is the interesting part. His prediction was completely wrong, but the 100 year precedent held up! Instead of neither the House or Senate changing majorities as Fisher predicted, both the House and the Senate changed majorities in 2006. Why is it so difficult to change majorities in the House? Partially because voters tend to like and re-elect their own representative, even if they have a very low regard for Congress as a whole. Approval ratings for Congress were worse than for Bush, but the overwhelming majority of representatives were re-elected. The fact that both parties conspire to gerrymander districts to the advantage of incumbents is another big factor making it difficult to unseat incumbents in the House of Representatives. After the 2008 election, with 8 seats still undecided, the Democrats picked up an additional 20 seats and will have a crushing 81+ seat majority in the House. Given the difficulty of changing majorities in the House, there is almost no likelihood of Republicans retaking the majority before 2014 and probably longer (even with strong political winds at their back the Democrats only picked up about 20 seats in'08 - do the math). That leaves the Senate as the only determinant of whether divided government can be restored in 2010. In 2012, either re-taking the Senate or the presidency are possibilities for Republicans. The presidential race will be completely determined by Obama's performance in the first term, and is unknowable now. So, looking forward to 2012, we will also focus on the Senate. In 2006, the Republicans had a small structural advantage in the Senate races, since 18 Democratic seats were contested as opposed to only 15 Republicans. Nevertheless the Democrats held all of their seats and took six seats from the Republicans and a narrow majority. In 2008, the Democrats had a huge structural advantage. 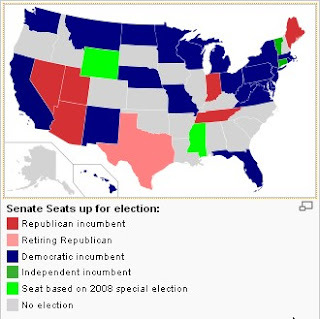 There were 35 Senate seats contested in 2008 (33 regular and two special elections). Of these, 23 were held by Republicans and 12 by Democrats. Simple numbers - the Republicans had a lot more at risk, and were playing defense. The Democrats had many more opportunities to take seats than Republicans. Big advantage for Democrats. Assuming that the 3 seats that are still undetermined will fall 2-Republican 1-Democrat, the final results will be an 7 seat pickup for the Democrats and a 58 - 42 majority in the Senate. In 2010 The Democrats will again have a structural advantage. 34 Senate seats will be contested. Of these, 19 are held by Republicans and 15 are held by Democrats. This is comparable to the advantage that the Republicans held in 2006. It seems highly unlikely that the Republicans will be able to duplicate the feat that the Democrats pulled off in 2006. To retake the Senate, the Republicans would have to hold all their seats, and take more than half of the Democratic seats up for re-election. Obama and the Democrats would have to screw-up on a scale of how the Republicans screwed up in 2000-2006. They would have to pile up a record of corruption and incompetence in two years comparable to what the Republicans did in six. I wouldn't say it is impossible, but it does seem very unlikely. The best the Republicans can expect in 2010 is to either hold serve, not lose any more seats, not lose the filibuster, or pick up a couple of seats and narrow the Democratic Majority. In 2012 the Republicans will finally have a huge structural advantage in the Senate elections. Of the 33 seats contested, 24 are held by Democrats and 9 by Republican. From this distance, the Republican seats look safe, and after four years of One Party Rule by Democrats, the electorate may be ready for some changes. If the Republicans can pick up two seats in 2010, they will only need to take six of the 24 Democratic seats to regain the majority. As mentioned before, it is probable that the Democrats will retain a majority in the House of Representative, although by then it will have narrowed. We will have One Party Rule under the Democrats for at least four years. 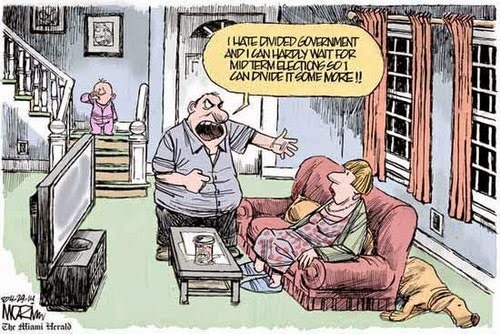 The next opportunity to restore divided government will be in 2012. The Republicans will have two ways to get there, so I will go out on a limb and make the prediction that divided government will be restored in 2012, either through the Republicans winning the presidency or (more likely) a majority in the Senate. 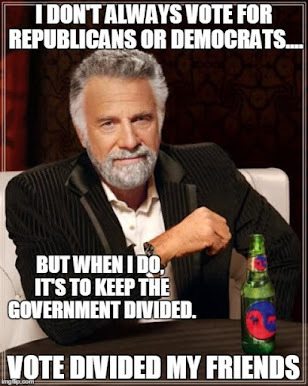 If the latter, we will be in the interesting situation that we have a divided congress, and regardless of which party wins the presidency - a divided government. That's a good thing. No telling what shape the country will be in by then. UPDATED: Fixed links, corrected typos, edited for clarity. UPDATED 06-August-09: 2010 Senate Scenario revised and updated in a new post - 2010 Senate Race Redux. UPDATED 31-August-10: 2010 Senate Race prediction revised and updated in a new post - Ten in Ten. I, for one, welcome our new Democratic Party Overlords. I don't know why all the fonts suddenly changed. It happened after I cut and pasted the spreadsheets into this post. Can't find the problem. Hope you like the new fonts. Thanks for posting up that South Park clip, that was hysterical, and it accurately portrayed what went on at Indiana University that night. So, I found it hysterically relevant. I look forward to reading more of your posts. You have great insight.